New Delhi, 12th August, 2016. Almost a decade of hard work, a lifetime of commitment to innovation and an inerasable flair for triumph has finally taken its turn to glory. In a fast paced competitive era, where sustaining Mid-Size companies are handful, Inovies has the privilege to join the Awardees of ‘Udyog Rattan’ and ‘Excellence’ conferred by Indian Institute of Economic Studies. Such honor has been given earlier to Mahindra Group, Shahnaz Hussain, Tata Group for their innovation in their respective fields. Now Joining the previous awardees, Mr. Bommasani Nagendra, Chief Executive & Managing Director, Inovies Consulting Pvt. Ltd., received Prestigious Udyog Rattan Award with great pride. 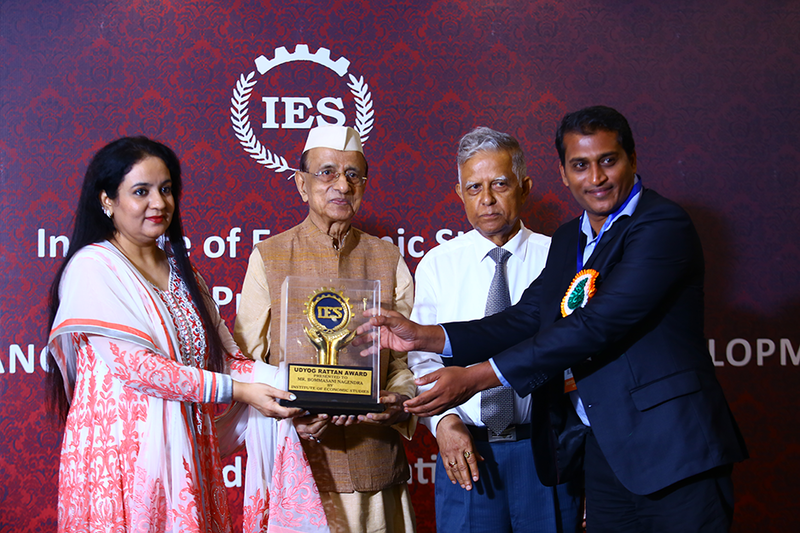 Inovies, a leading Web application Development Company in Hyderabad is honored with Excellence Award at the Economic Development Seminar organized by the Institute of Economic Studies (IES). The award is given for the outstanding performance by Inovies in the fields of Productivity, Quality, Innovation and Management. An excellence award is been conferred upon the company for Innovation in Technical writing services. Operational from Hyderabad and headed by Shaheen, Research and content, Excellence Award according to her uplifts their enthusiasm to do more and excel in each project. Presented by H. E. Dr. Bhishma Narain Singh, Former Governor of Assam and Tamil Nadu and presided the seminar by the dignitaries such as K. S. Popli, Chairman & Managing Director Indian Renewable Energy Development Agency Ltd. (IREDA) Govt. of India, Yogendra Prasad, President Institute of Economic Studies (IES) & Former Chairman & Managing Director of NHPC, Govt. of India. The seminar has been held in New Delhi where the key issues in India such as Energy consumption and production, skill Development and gaps in economic development have been discussed. The awardees are asked to work on the gaps towards next level of economic development though their respective organizational initiatives. Mr. Nagendra, MD & CEO, Inovies Consulting Pvt. Ltd, said, I extend my warm gratitude to the entire Jury of IES for recognizing the services of Inovies. More than an award, this accreditation shoulders a huge responsibility to excel in every facet of Inovies Services. More than management, our team of eminent and dynamic resources desire this accolade and hence I blissfully transfer this credit to my never tiring employees.